Transformational Tuesday: From goofy to debonair? 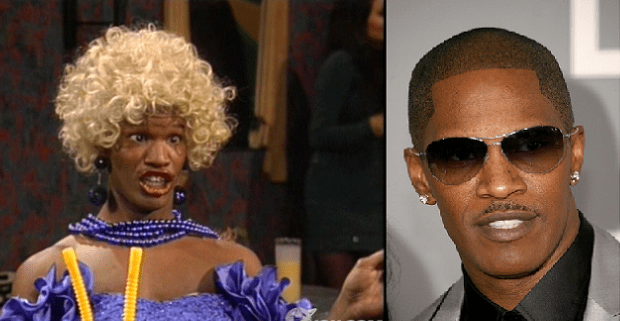 Jamie Foxx has completely transformed himself. Not just his look but his image and his career. How does one experience a transformation from goofy comedian to debonair R&B singer and A-list actor? Keep on reading. Even though Jamie Foxx was doing comedy we always knew the man could sing. He planted that seed over and over again on his show and in his comedy skits. When he finally made the leap to singer it came as no surprise. If you’re in one place whether in terms of your career or another area of your life and you want to go in a different direction, start planting seeds. Let people know your interests and show them your talent. Jamie Foxx leveraged his football experience to get his breakout role in Any Given Sunday. He then leveraged his musical talent in the film Ray. If you’re trying to make a leap, build a bridge. Leverage experiences and skills you already have to get you to where you want to go. This needs no explanation. Jamie Foxx said he had to work really hard to get the role in Any Given Sunday. Transformation doesn’t come easy, but it’s worth it.